LORDSTOWN, Dec 2, 2018 – Michelle Ripple has experienced the ups and downs of the General Motors Lordstown plant her entire life. Her father worked at the plant for more than 40 years; she’s worked there for 18. The 49-year-old mother of three works as a carpet retainer installer. Like many in the Mahoning Valley, the plant has been an integral part of her family’s history and ability to earn a living. Extended family members have worked there, too, over the years. At family gatherings, these were the people who Ripple could talk to about her work, knowing they would get it. So when Ripple, of Hubbard, was called into a packed meeting at the plant Monday morning – where workers learned that GM will cease production of the Chevrolet Cruze and indefinitely idle the plant beginning March 1 – the news packed a punch. She tried to shield her youngest daughter from the news, but the 14-year-old couldn’t miss the nonstop news coverage or talk at her school. “She’s very emotional,” said Ripple. Her daughter is worried about what will happen with the family’s finances; Ripple assures her they will survive. Ripple knows this is true – but that doesn’t mean she knows what to do next. She’s weighing her options as March 1 looms. The uncertainty is hard, for her and other Lordstown workers who shared their stories this week. But despite the grim news, many expressed hope that this isn’t the end of the plant. They’re staving off that thought, at least for now. That would be too much. “I’ll have hope until the very end,” Ripple said. It wasn’t clear at the time, but General Motors came to the Valley at an opportune moment. The plant’s first car – a Chevy Impala – rolled off the assembly line April 28, 1966. A little more than a decade later, the Valley would be brought to its knees by the collapse of the steel industry. Over a several-year period, steel mills across the Valley shuttered, beginning with the sudden and devastating closure of Youngstown Sheet & Tube Co.’s Campbell Works. The announcement came Sept. 19, 1977 – a date now remembered as Black Monday. Just like that, thousands of jobs went up in smoke. Thousands more steel jobs disappeared in the next few years. But at least the Valley had GM. “That was all happening from 1977 to 1980, and at the same time, General Motors was expanding,” said Bill Lawson, executive director of the Mahoning Valley Historical Society. “They had opened the plant in 1966. They added a van assembly plant in the 1970s, and a metal fabricating plant after that. Employment at the plant has dropped since its peak in the 1980s – two years ago, there were about 4,500 workers there. Now, after two shift layoffs, there are about 1,500. Through it all, the Valley has maintained a sense of pride in the Lordstown complex and the vehicles it produces, from the Impala to the Chevy Cavalier to the Cruze, which the plant started producing in 2010. The shutdown of the plant, then, will have an impact beyond job and revenue losses. “It will affect Trumbull County’s budget quite a bit – and yes, it’s going to have a very negative impact on our perception of ourself and our self-worth, much as [the collapse of the steel industry] did 35 years ago,” Lawson said. The economic losses, too, will be significant, economists say. Experts note that beyond the estimated 1,600 workers expected to be impacted at the plant and other local companies GM contracts with, the effect of the shutdown will ripple across other companies in the plant’s supply chain, into other industries and to communities beyond the Valley. So, how large is that multiplier? Locally, there are several companies that are directly tied to the plant. 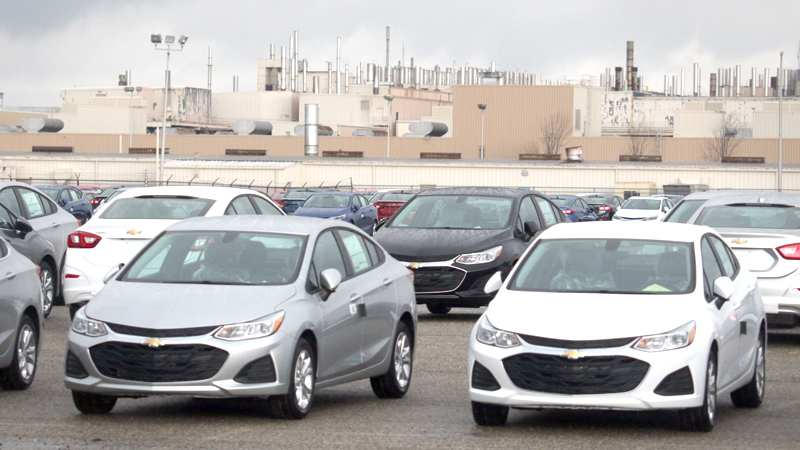 Lordstown Seating Systems, which makes seats for the Cruze, reported it would lay off 83 employees earlier this year after GM announced it was cutting the Lordstown plant’s second shift. A company representative declined to comment Friday on the impact of the plant halting production next year. Jamestown Industries, which supplies the plant with front and rear bumper covers for the Cruze from its plant in Youngstown, said last week that recent attempts at diversification put the company in a better position to weather the idling of the plant. Jose Arroyo, United Steelworkers business representative for this area, was not as optimistic about the future of Comprehensive Logistics/Source Providers in Austintown, which does logistics and warehousing for GM Lordstown. With the previous layoffs at the plant, Source Providers laid off more than 350 people, Arroyo said; about 180 employees remain. Arroyo is also hearing concern from other companies whose workers he represents, such as aluminum and steel companies. “Everybody is kind of holding their breath right now and hoping the talks with General Motors will end up in a new vehicle or retooling of the plant,” he said. The impact will be felt by small businesses with less direct, but still significant, ties to the plant. Our Place Diner in Lordstown is owned and operated by a family with deep GM Lordstown ties. The impact of the plant on their family’s business is significant. As for what the future holds for Our Place Diner, Woodward said they are taking it one day at a time and holding out hope. “We have employees who rely on us. There are customers that won’t be impacted by GM, and you hope to stay open for everybody that needs a place to stop and eat,” she said. As for how this ripple across the local economy will play out, Sumell said it will take years for the full effect to be realized. And as for what that impact will be, he cited research indicating that lost manufacturing jobs result in other job losses. “Studies on similar situations have suggested that about three additional jobs [for every lost manufacturing job] would be lost over the course of years – which would put the total in the range of 7,000 or 8,000 jobs lost,” he said. As a percentage of the Valley’s total workforce of about 220,000, that is fairly significant, he said – and he noted that it would accelerate a long-running trend of the Valley’s employment declining each year. The good news is that the Valley’s economy is more diversified today than it was back in the 1970s when the steel industry went under – and that trend likely will continue. In the future, it’s more likely that employment will be spread across a variety of companies – for example, a brand-new, state-of-the-art energy center in Lordstown that cost $1 billion to build employs about 20 people, who earn good wages. Who that might not benefit is the GM Lordstown workers who are facing layoffs and an uncertain future. For many, it will be a question of retirement or moving or investing time and money into training for a new career. As Sumell notes, that’s often easier said than done. But if there is any upshot, it may be that the Valley’s past economic woes have prepared it for this moment.